Please give your task unique Name and set the Start time. The default start time is the current time. If you want to stop the task over time, please set the Stop time too. There are two types of repetitive tasks. The first type is a task that is repeated every few seconds, minutes, hours or days. Indefinitely or specified number of repetitions. The second type of tasks is the task that is active only on selected days of the week. Next you need to select the mail type of task – Player, Zone, Jingle or General task. 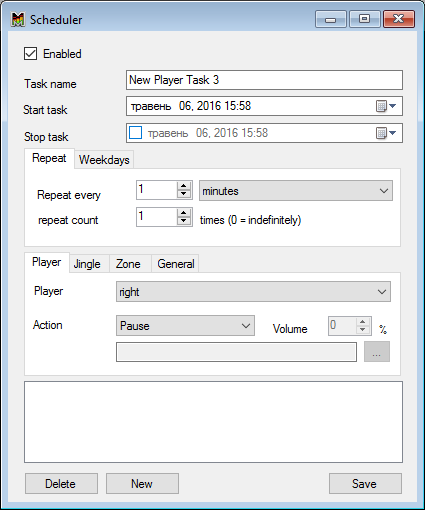 The first often used task is Player task. Select the player, select the action. 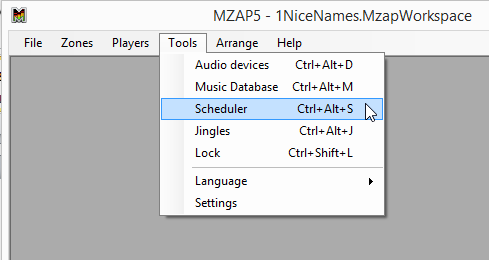 Depending on the chosen action, you can set the volume or choose the path to the file. Zone task is the same, but its actions are slightly different. 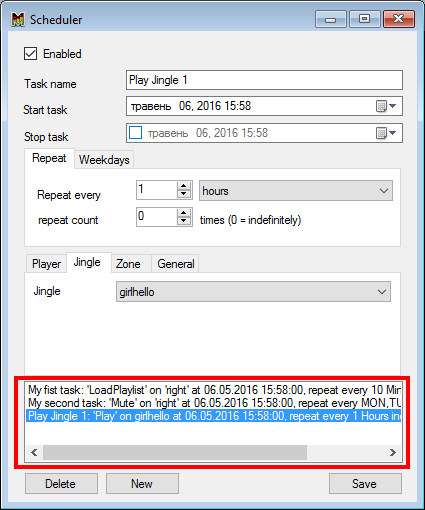 Jingle tab has only one task, play selected Jingle. And with General task you can schedule Save Workspace action. Once finished click Save button. The new task will appear in the list below. Here you can find all the tasks. To delete a task, select it from the list and click Delete button. 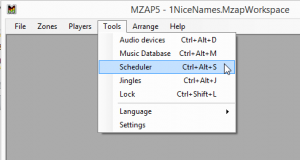 To create a new task, click New and specify a new unique name. Feel free to explore all possible actions. If you want to edit a task, find it in the list and double click it. The selected task will be loaded into the editor. Change the settings and click Save. If you need temporarily disable the task, select it, turn off Enabled checkbox and Save it. Follow our news, we are constantly adding new scheduler types and actions.